Plugbuster™ System for Urinals – This 2 part liquid system is designed to return slow flowing or plugged urinals back to normal flow. Think of it as a low cost alternative to mechanical snaking – almost like a “liquid snake”. Designed specifically for use in both waterless and low flow flush urinals, it could also be used in regular flush urinals as well. ESS has a full line of urinal care and janitorial products to suit almost every need. As always, read and understand the Material Safety Data Sheet (MSDS) before using any chemical product. Keep all chemical products out of the reach of children and pets. ESS urinal care products are designed to treat and minimize plugging caused by calcium scale, struvite, hair and organic debris. The Plugbuster™ System for Urinals is a 2 step process for clearing plugs in waterless, low flow flush and even full flush urinals. Plugbuster™ System for Urinals – this 2 step process is designed to reverse slow moving or plugged waterless or low flow flush urinals back to normal flow. This “liquid snake” system is a convenient and low cost alternative to mechanical snaking or removal of the units from the wall. Following the enclosed instructions, just pour in, let sit and rinse for each step to restore urinals to proper flow. Available in a convenient case pack with 3 urinal treatments (6 bottles total). This acidic cleaner is Step 1 for easing complete plugging or slow moving drains on waterless urinals or low flow urinals. It effectively attacks and dissolves calcium and struvite residues, which tend to coat inner piping and debris, contributing to drain plugging. It has strong performance, yet is considered to be less hazardous than typical mineral acids like hydrochloric and sulfuric. Powerful inhibitors make this product non-corrosive to steel and cast iron (when diluted) so there is less risk to piping. It is also considered to be non-corrosive to skin (although it is corrosive to eyes). The Step 2 Activated Trap Cleaner is a unique blend of powerful surfactants, enzymes and bacillus organisms that combine to tackle organic build up in urinals that can lead to slow flow or ultimately plugging. Modeled after long proven wastewater treatment and drain plug removal technology, this product is designed to reduce solids in near anaerobic environments like waterless urinal trapways and drains. The enzymes and non-pathogenic micro-organisms used in this product are designed to attack hair and other organic debris that can build up in trapways, drains and sewer pipelines. Janitorial Products – Products for the cleaning and maintenance of offices, restrooms and other common building areas. 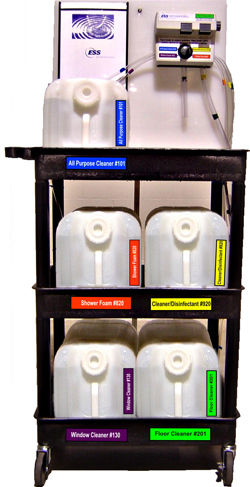 Most products are available in 4×1 case, 40 lb pail, and 450 lb drum quantities and are typically used in trigger spray bottles filled via dilution station. Ready-To-Use (RTU) versions of products are also available upon request. ES-101 This dilutable neutral pH multi-purpose cleaner can be used to clean virtually any hard surface including countertops, showers, glass, walls, mirrors and many others. Typical recommended dilution is about 10:1 for tough jobs and up to 40:1 for routine cleaning. ES-201 This dilutable neutral pH floor cleaner can be used to clean virtually any types of flooring without the risk of damage, including concrete, tile, marble, wood, laminate, vinyl, among others. Typical recommended dilution is about 20:1 for tough jobs and up to 40:1 for routine cleaning. ES-920 This dilutable neutral pH quaternary ammonium-based sanitizer/disinfectant can be used on virtually any hard surface to kill a wide spectrum or organisms, fungus and viruses, including escherichia coli, staphlyoccoccus aureus, listeria monocytogenes, asperigillus niger, salmonella enterica, psuedomonas aeruginosa, and klebsiella pneumoniae, among others. Recommended dilution is 32:1. Formula is EPA-Registered. Drain Seal Liquid This RTU product is effective at controlling odors in low use drains where the water in the drain trap can evaporate. This oil-based product will not evaporate, leaving long term and almost indefinite odor prevention and control in warehouse floor drains and other drain types that get little to no use. Typical usage is about 6 oz per drain. Not for use in waterless urinals.